relationship with Belial, more or less. Now, years later, things have changed. Not so long ago I dreamt vividly about a magickal ring. In that dream I took it in my hands and examined it closely. 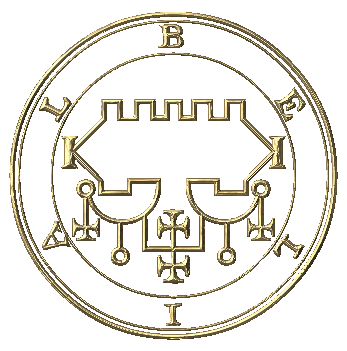 It was made of gold, marked with dark brown unknown sigil and inscribed with the name Belial. Holding it in my hands, I was on the verge of realizing something important and deep. At the same time I felt a strong presence of something not at all dark or evil, but powerfuly familliar...and I woke up. That was enough to sparkle up my interest. Later that day I decided to perform a ritual and to summon Belial. I wanted to know what the heck was going on. I used no triangel, no circle, no standard Goetia procedure. Just clear awareness of my true (non)self and sharp intention. He manifested rather quickly, right outside the window of my room, as per my intention (later on I invited him into the room). After usual emotional-mental reaction on my part in similar rituals (his presence seemed to clear up my main illusions about him) things calmed down. I could feel his power, and for a moment there I forgot about everything. Sheer power, not bad or evil, just a very strong presence. Belial is said to be of the element of earth, and thats exactly what I percieved. In our exchange I was respectful, no Goetia-like threats were involved on my end and he was calm, composed and clear. It was obvious that his wisdom way surpases mine. Interestingly enough, he did not send that ring and energy projection into my dream; he explained that sometimes humans can see into the future in dreams. He answered my questions patiently and accepted my requests without a word. He didnt ask anything in return as he already took an oath in the Abramelin op. I asked him what else he can do to help me on my path. His answer was: "I can remove your ignorance that brought you before me." His answer seemd a bit cheeky at first but I soon realized that I am not just ignorant, Im also arogant. So, I asked him to elaborate a bit and he explained that the fairytale humans are telling themselves about the 'fall' and war between darkness and light and demons and angels is just that: a fairytale. Not all that new to me, but to hear this from one of the most 'dark' and supposedly demonic spirits, well, thats different. He also suggested a few other things which were right on the money. Already during the ritual I felt great, full of energy and high spirited. We talked as old frends. He really is a great teacher, a master of all things esoteric and magick. He imparted great secrets and said that he can teach me much more. At that point my ignorance/arogance again become obvious: "There is more!? ", I asked, surprised. Well, his help become reality in less than 6 hours. He is fast, no doubts there. That day and night I experienced what I can only describe as a miracle. An obstacle I was facing for a very long time finnaly fell off, thanks to Belial. ...it is just human shortsightedness and stupidity that paints such helpful beings like Belial dark and evil. Thats my experience, of course. Enns are calls of invitation, admiration, or protection to certain Spirits that are chanted, vibrated, or spoken. They can be used during evocation ritual, meditation, to connect to a Spirit for protection etc. Enns are very similar in intent and effect as Eastern mantras in producing a specific magical effect. I asked Belial about his enn and he said: "I notice a person repeating these words immediately and can come closer if desired".